I know what everyone is thinking – Donna misspelled ‘pi’. She also celebrated Pie Day back in January, so what’s this all about? Well, being an engineer by trade, I, of course, celebrate PI Day. It’s March 14: 3-14. Get it? Not to diverge too much from Grow It Eat It, but for those of you who may not be aware, ‘pi’ is a Greek symbol that represents the ratio between the circumference and diameter of any circle. This quantity, which is actually an irrational number, happens to be roughly equivalent to 3.14. 3.14-March 14, get it now? Not so irrational after all, I’ll wager. Check out: http://www.piday.org/ for more information. Okay, now on to the relevance to Grow It EAT It! You can’t see it, but the plate has a ‘pi’ symbol in the middle of it, and the rim sports the first hundred digits of ‘pi’ (the digits go on forever, you know). But what kind of pie, you ask? Well, once again I opted to make my own crust, for authenticity purposes, and because I just love black raspberry pie, I took out some berries from the freezer and went to town. (Ain’t it great to have a stash, for special occasions?) I admit I don’t need to get fancy for my pies as I never really seem to get tired of black raspberry. I guess that’s why I inspired my husband, Nicolas, to start growing berries in our back yard. Perhaps he’ll blog on that, later. By the way, for those of you who are wondering, get your own ‘Pi’ Plate here. 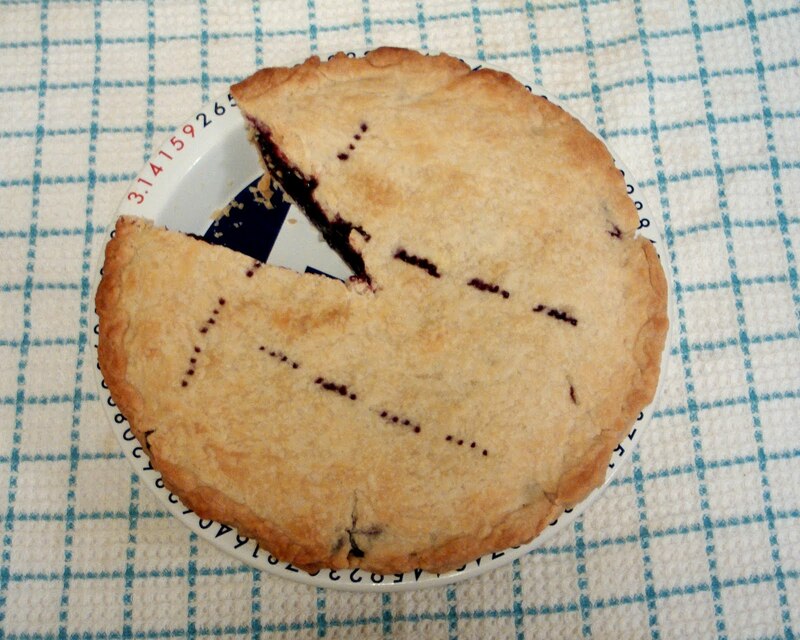 The raspberry pie recipe I used is a standard Betty Crocker blueberry pie recipe. For raspberry, increase sugar to 1C, and omit lemon juice. ← Indian Corn: More than Ornamental? Hmmm!, Pie was good !!!!!!!!!!!!! !